This turtle occurs in the Atlantic and also has an extensive range throughout the Indian Ocean and the Pacific. It is still believed that Atlantic and Pacific Loggerheads belong to the same species. The name comes from its enormous head, which is nearly twice as wide as that of the green turtle and apparently well fitted for feeding on bottomdwelling invertebrates such as sea urchins and giant starfish. 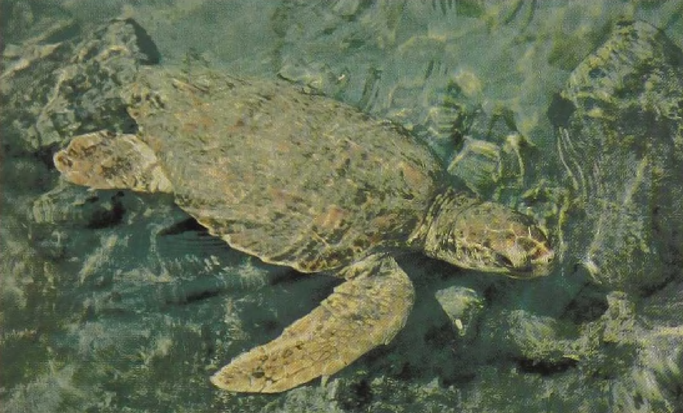 Like all other sea turtles the Loggerheads lay their eggs on selected beaches in specific seasons. Dozens or hundreds of animals may come ashore in a restricted area during a relatively short period of time. They dig holes with their hind flippers and deposit between 1 00 and 350 eggs 5 to 22 inches deep in the sand. After covering over the nest, the mother roughs up the surface of the beach over a wide area in order to hide the exact nesting place. The young all hatch at the same time. As they start to scramble upward simultaneously, they break down the roofing soil and continue moving on it as it falls. Escape from the nest is thus a communal affair; hatchlings from individual eggs buried beneath 20 inches of sand would probably perish.